NOVEL IDEAS FOR THE DRAWING ROOM. by J. Chalmers. The following will be found to be a very pretty trick, and it has the further advantage of requiring very little practice for its performance. A blue thimble is produced, and this the performer sticks on the middle finger of his right hand, incidentally showing the hand to be quite empty, now keeping the palm of his hand towards the audience, he gives it a slight wave and the thimble is seen to have changed from blue to red. 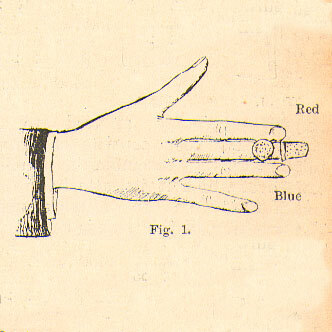 The red thimble is removed by the left hand and given for examination, the right hand being shown back and front. The trick can be made “ stronger ” by replacing the thimble on its original finger, and changing its colour back to blue. Two thimbles are made use of — one blue, which fits over another which is red. The two together are first produced from a back palm, or in any other way the performer wishes. They are then placed on the middle finger of the right hand, and after the hand has been shown empty, the outside blue shell is gripped by the first and thin fingers, the middle finger at the same moment being bent thus drawing the red thimble out of the blue (Fig. 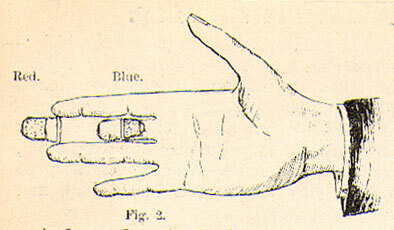 1) If the middle finger is quickly straightened out, the blue thimble will be pushed round to the back of the hand (Fig. 2). With a little practice all the above movements merge into one, and if a slight up-and-down motion is given to the hand while performing it, the illusion will be perfect. To change the red thimble back to blue the above movements are reversed.